card games, graphic design - Fyodor Soloview . and Lyudmila Lygina (European man on the front cover). for photo images of Americans. As an encyclopedia of the world fashion designs, Six Generations deck can attract many famous artists, as well as the old illustrations might be used as well. When someone invents something new, most people do not recognize its value. The makers usually have trouble getting their product to market. They simply can’t express its value clearly enough. The standard playing cards have been on the market for 700 years. By making the cards representative of generic Kings and Queens, they have survived. Add to that the literally myriad games that are playable with them and their utility are obvious. Today, society has changed. Nobility is no longer genetic… it is in the individual character. To hold onto our heritage and history, the family genealogy of every ancestor is important. 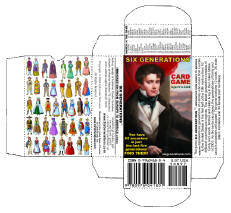 Thus, the new version of the playing cards, Six Generations, was designed. Six Generations cards became the ultimate deck for all nations, reflecting the reality of US history… we are a nation of immigrants. 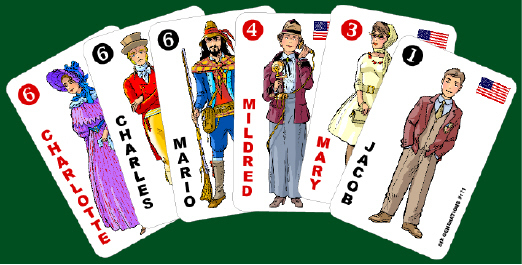 The current deck, showing the immigrating Europeans to America, is just the sample of what could be done later by the numerous designers around the world. This product could be licensed around the world, having revenues from billions of copies sold - from for the home usage to the casinos. To replace the traditional card decks with one that meets current geopolitical conditions, rather than promote the old imperial structure. Once there are a compelling number of games that can be played with Six Generations cards, there will be a transition away from the suited and royalty based card games, and a move to play more, different games with Six Generations cards. Six Generations is a Revolutionary and ‘thinking man’s” card game, challenging the valuation of the card system of “Standard Decks”. The deck’s distribution of value is geometric, rather than linear, in progression. Play develops a chess-like appeal, as the players begin to develop strategies three and four turns ahead of their current situation. With broader reach, and other artists and cultures, Six Generations can expand into an international business model, with version available all over. This product has perfect usage in education, arts, museums, and homes. A uniquely developed product with museum quality artwork and genealogically and historically interesting mechanic, Six Generations is a singular product challenging the status quo of what the world has come to call “a deck of cards”. Current focus is on those with a genealogical bent, but the intent is to broaden that base to include game players at large. It is a quality game, but the real and present value is as a genealogical and historical gift product. This focus and aim is clear not only in the level of detail that has gone into development, but also in the focus and in intent of its designer in his current promotion and rhetoric. 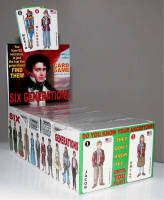 SIX GENERATIONS is a registered trademark of Six Generations card games/playing cards. All rights reserved. Copyright 2004-2014 by Fyodor Soloview. The information about Six Generations card games may be copied and reproduced in any form only for educational, promotional, advertisement and entertainment purposes, and for sales of this card game, and for no other purposes without the permission from the publisher. by establishing your own business/self-employment with as much as $10 investment. 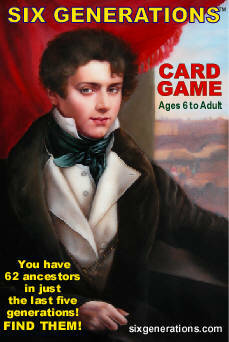 Get a pack of Six Generations cards, learn to play the games, read reviews, understand genealogical impact, make up your mind, order the games from us, and sell it retail or wholesale to whoever you want. How to start: email us to get your purchase rate (the rate you will buy Six Generations from us.) No minimum purchase required. The rate is below wholesale cost, so the stores will buy from you, and you will get the profit. For advertising at our website, please contact us at soloview@gci.net.